With all of the other expenses you face, the size of your paycheck after taxes are accounted for can be especially frustrating. However, that bite can be considerably larger or smaller when you’re living in a state with differing tax policies, found a new study by GOBankingRates. The study honed in on four different tax categories that will vary from state to state: income taxes, property taxes, sales taxes and gas taxes. After determining what the average resident of that state would wind up paying for each over the course of the year, the states were then ranked based on their residents’ estimated tax bills. The results showed that plenty of Americans are facing a significant tax burden after you factor in state tax rates, with 26 states and the District of Columbia seeing the combination of state and federal taxes taking at least one in five dollars you earn over the course of the year. They also displayed a clear geographic trend that would appear to be rooted in politics. For the most part, the states with the highest taxes are mostly staunchly blue states with a history of voting Democratic, while the least-taxed states are almost entirely red states that are reliably in the “R” column. The outliers on both the top and bottom 10 are interesting, though. The lone red state among the 10 most-taxed in the country is the Lone Star State of Texas — despite the fact that Texans aren’t paying any state income taxes. Texas just climbs into the bottom 10 by virtue of the fifth-highest property tax rate in the country and a sales tax rate over 8 percent. The two blue states that managed to creep in among the states with the lightest tax burdens are New Mexico and Delaware. Delaware hasn’t voted for a Republican for president since the first George Bush, and it has a state income tax rate that’s higher than most states. 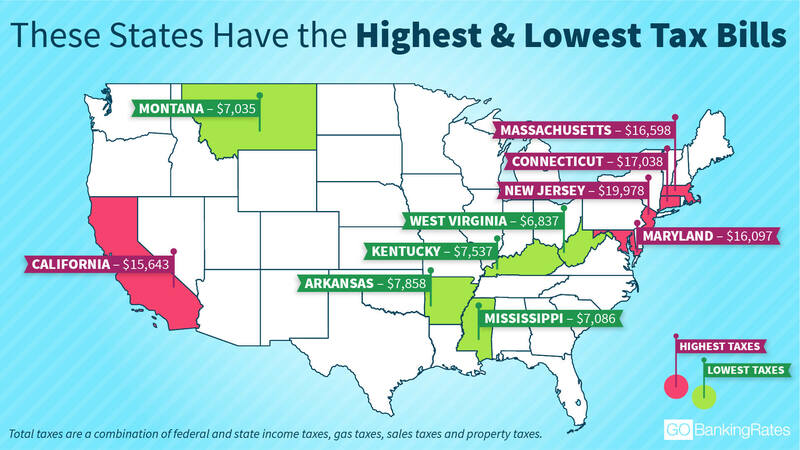 However, thanks to relatively low property tax rates and no sales tax, Delaware is the second-least taxed state behind only Montana in this study. Click through to see the 10 most tax-friendly cities in the U.S. Methodology: To generate the tax bill in every state, GOBankingRates surveyed four key taxes: 1) Income taxes, 2) Property taxes, 3) Sales taxes and 4) Gas taxes. Income tax bills include both state and federal taxes and are based on 2016 Census Bureau American Community Survey median household income figures. Property taxes were calculated using each state’s rate and Zillow’s median home value index, data as of January 2018. Gas taxes are based on each state’s rate and an average annual consumption of 656 gallons, sourced from API.org on March 6, 2018. Sales taxes were calculated using each state’s tax rate, sourced from Tax Foundation, and Americans’ average daily spending of $101, sourced from Gallup. Learn how to file taxes as an independent contractor.